Not all yoga is about striking a pose or stretching your muscles. 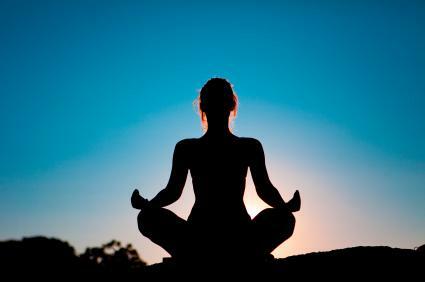 Bhakti yoga is one of a host of different types of yoga. Bhakti focuses on a more spiritual or religious aspect of the practice. According to the Sivananda Yoga Vedanta Centres, there are four main paths of yoga: Karma yoga, the yoga of action; Raja yoga, the yoga of physical and mental control; Jnana yoga, the yoga of wisdom, and finally Bhakti yoga, the yoga of love and devotion. Practitioners of Bhakti yoga devote themselves to love for God or a higher power. Bhaktas may perform any or all of these nine primary activities to progress towards the ultimate goal of bhakti yoga: achieving pure love of their God. Although bhakti yoga places few firm demands or regulations on its followers, Swami Rama cautions that the path of bhakti yoga is not an easy one. This form of yoga is not for those who want to follow blindly, he says. Bhakti yoga requires the courage to face and accept all aspects of yourself, good and bad, and to offer yourself completely to a higher power without holding back. The Bhagavad Gita is one of the key texts of bhakti yoga. These ancient verses tell the story of the Hindu deity Krishna explaining to his disciple, Arjuna, the different paths of yoga, including bhakti yoga. According to the Bhagavad Gita, bhakti yoga is synonymous with a life devoted to God through service, prayer, and meditation. Ultimately, however, the practice of bhakti yoga is not about any one teacher or set of dogma. Its most important doctrine is "Love is God, and God is love." The most important step in practicing bhakti yoga is to sustain the mood of devotional love and to make that love the primary motivation of your deeds, words, and thoughts. The bhakti yoga lifestyle can be a rich and rewarding one for all its devotees regardless of faith.